During its Next Horizon event in San Francisco, AMD announced a number of new products geared towards boosting data centre performance as well as its new partnership with AWS that will allow businesses to leverage its EPYC processors via the cloud. The chipmaker began by providing details on its upcoming 7nm compute and graphics product portfolio aimed at extending the capabilities of the modern data centre. AMD also shared some new specifics on its 'Zen 2' processor core architecture while launching the 7nm AMD Radeon Instinct M160 graphics accelerator. 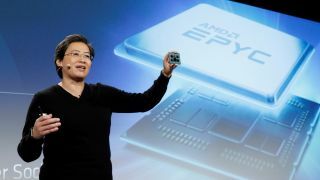 The company also gave the first public demonstration of its next-generation 7nm EPYC server processor codenamed “Rome”. Amazon Web Services (AWS) was also in attendance and the cloud platform company joined AMD on stage to announce the availability of three of its popular instance families on the Amazon Elastic Compute Cloud (EC2) powered by the chipmaker's EPYC processors. For the first time, AMD provided details on its upcoming Zen 2 high-performance x86 CPU processor core that is the result of a new revolutionary modular design methodology. This modular system design uses an enhanced version of the company's Infinity Fabric interconnect to link separate pieces of silicon, called chiplets, within a single processor package. The Zen 2 multi-chip processor uses 7nm process technology for the CPU cores which take full advantage of the advanced process technology while a mutre 14nm process technology is utilised for the input/ouput portion of the chip. The end result of using a modular system design is much higher performance, lower power consumption and other improvements that can help reduce data centre operation costs and cooling requirements. AMD's Radeon Instinct M160 and M150 are the first 7nm GPUs and both products are scheduled to ship to consumers this quarter. These new graphics cards are based on the Vega architecture but are specifically designed to be used for machine learning and artificial intelligence.